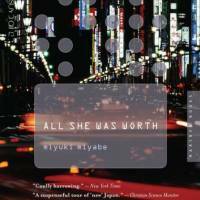 Give the lingering late-summer heat the slip and duck into the shadows with “All She Was Worth,” a classic Japanese crime mystery. 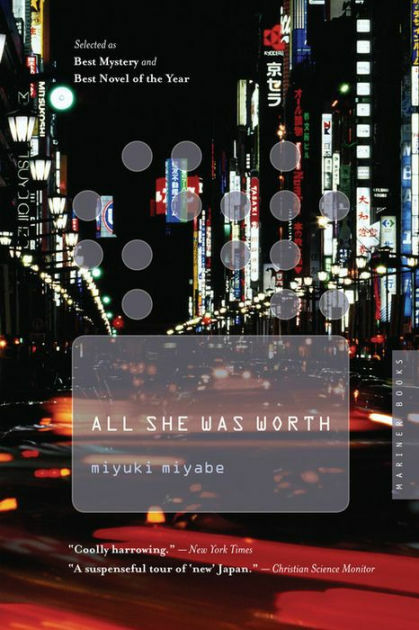 All She Was Worth, by Miyuki Miyabe, Translated by Alfred Birnbaum. In this sinister thriller, Miyuki Miyabe leads the reader down the alleyways of loan sharks and debt in modern Japan. Winner of the 1993 Yamamoto Shugoro Prize, the novel is a triumph on several levels. Miyabe’s characters are multi-dimensional and therefore have a wide appeal. There’s her world-weary but compassionate detective, Shunsuke Honma, a widowed dad on extended leave from the police force after a bullet wound, and his target and nemesis, the beautiful, enigmatic Kyoko Shinjo, once innocent prey to loan sharks, now a predator herself as she resorts to betrayal and murder to escape the debts of her father. Even the book’s minor characters are fully developed, revealing everyday aspects of both city and country life in modern Japan. The novel also reads like social commentary, giving the reader an extensive lesson on the various credit scams and pitfalls of Japan’s consumer-driven economy. Finally, as a straight-out mystery story the novel ultimately satisfies; it takes many unexpected twists and turns before the last page of revelation. All in all, Miyabe’s work stands the test of time and provides many moments of cool contemplation as summer fades into autumn.